HOP ONBOARD FOR OUR EASTER 2019 SINGAPORE SAILING EGGSTRAVAGANZA! The highly celebrated Easter weekend is speedily hopping our way and you’re going to need some egg-cellent ways to keep your little bunnies amused over the long Easter weekend. For the month of April, Royal Albatross is introducing a delightfully curated lunch with a plethora of indulgent barbecue dishes and delectable grilled meats to keep your bellies and hearts filled. If you cleverly spot our bunny mascot over the Easter weekend and snag a Kids Dine Free voucher from her Easter Sunday basket, the little ones below the age of ten dine for free! * Hint: Royal Albatross’ bunny Mascot will be sauntering around SEA Aquarium at Resorts World Sentosa. Reserve your seats in our Restaurant and Bar early to avoid disappointment! Besides a gastronomic eggs-perience, more Easter Sunday fun is afoot, onboard the Royal Albatross. As you lounge on the upper decks of our luxurious tall ship with the sea breeze in your hair, rally your posse and enjoy a truly Happy Hour between 3 – 6 pm! Scamper onto our Facebook or Instagram pages to cleverly spot all the Easter bunnies in their favorite hiding places to win a delicious main course and 10% off the total bill as part of the Easter celebrations! Winners will be announced on 23rd of March 2018. Lastly for the most egg-stravagant Easter activity worth hopping over to – the Royal Albatross Easter Sunset Sail. Whether you are observing the festival or simply celebrating the much-needed break, hatch a plan to take your family or loved ones out sailing on the waters under a starlit sky for an Easter dinner. Fill your glasses with champagne and revel in the epicurean delights, which are sure to resurrect everyone’s good spirits. Enjoy the air-conditioned Grand Salon in all its grandeur, or pose on the Flying Seat for that stunning photo (don’t forget to #royalalbatross). Be regaled by a live acoustic three-piece band as you relax under the stars – young ones, lovers and families kept well-entertained throughout the sail. Book your tickets for the Easter Sunday Sunset Sail now for that exceptional sail with someone special. 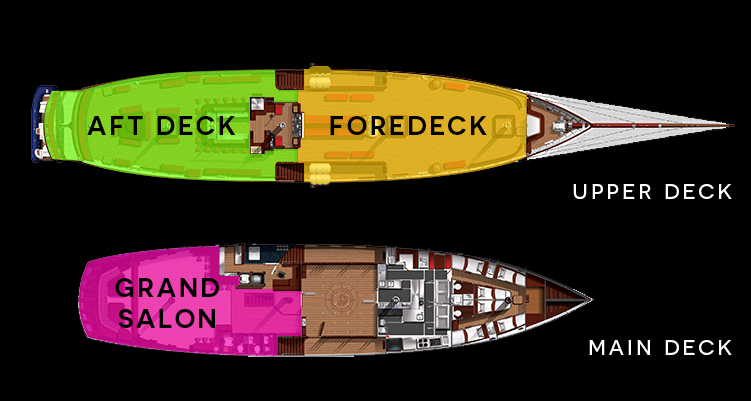 Enhance your sailing experience with the best seats on the upper foredeck (and aft deck if all Platinum SSS) and be pampered with a plated three-course dinner, a welcome drink and dedicated servers to look after you and any special requests. Highly recommended for an extraordinary and intimate dining experience, romantic surprises and for families who welcome privacy. With free seating and freedom to move around, enjoy the luxury and comfort of our air conditioned Grand Salon and the upper aft deck of this amazing Superyacht. With a sumptuous buffet dinner, live music and access to 2 bars, it’s recommended for those looking for a more casual but equally memorable and entertaining cruising experience. Interested in the complexities of sailing a Tallship in the worlds busiest port? 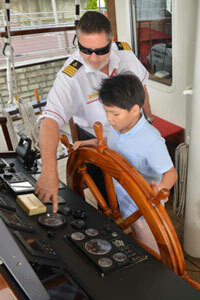 Under supervision take the helm of our magnificent sailing ship and learn more about the Royal Albatross. Although an ancient relic on the outside, beneath the surface, she has the latest control, navigation and comm systems. Bookings are subject to confirmation and availability so apply early!